A 1st impression . . . is a lasting impression . 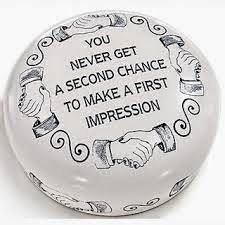 . . if not a last impression. It’s an old familiar saying, and an important concept for job seekers to really grasp. Because . 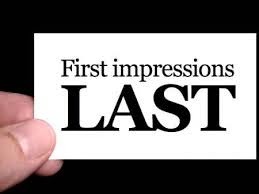 . . First impressions count. First impressions can make or break your prospects for getting hired. Pay attention to the "cover" you project!
. . . we do, and we do it all time in our interactions with each other. Judgements are made about you all the time, and it is frightening how quickly they are made. In seconds - in fact, in split-seconds - judgements are made and opinions formed about your . . . . .
- financial status . . . . . .. and lots, lots more. We've all heard that people form impressions of us in under 60, or even 30 seconds. However, Princeton psychologists Janine Willis and Alexander Todorov say it's even quicker: "All it takes is 1/10 of a second to form an impression of a stranger from their face, and longer exposures don't significantly alter those impressions." Their research was presented in their article First Impressions, in the publication Psychological Science. Make a positive first impression, and you get to advance to the next step in your job search process. Make a negative initial impression on a person with whom you are meeting, networking, or interviewing, and your chances of advancing to the next step are slim to none. So, take care as you network, when you interview, and in the production of your written materials, i.e. marketing materials, (applications, resumes, cover letters, thank you letters, business cards) to put your best foot forward. - Hard as it may be to hear, take the feedback you receive and put it to work. - Identify the gaps, and fix and fill them! What are the things that hold you back from making a great first impression? Here are some things to check that may be making or breaking your ability to make a positive first impression. ✔ Check any written materials for typos, format, and correct information. ✔ Check that you have with you your “marketing materials” - business cards, phone, a couple resumes - any time you leave the house. ✔ Check your appearance. While you don’t have to be in a suit and tie, or suit and heels, for a Saturday trip to the grocery store, look presentable enough that you would not have to duck down the frozen foods isle if you spot a network contact or recruiter or hiring manager walking toward you. ✔ Check your attire. You don’t have to be - and shouldn’t be - a fashion plate, but inspect your wardrobe to ensure you are not wearing fads or outdated clothes that could lead a contact or interviewer to wonder if you are too far out there creatively for their business, or outdated in your knowledge or skills, or respectively. ✔ Check your speech, tone, and voice. Record yourself talking and see if your style of speaking helps or hurts your delivery when introducing yourself and talking about your capabilities. ✔ Check your mannerisms. Do you have distracting habits that would distract a listener from really hearing what you’re saying? ✔ Check your hairstyle. Does it date you, either outdated or too, too fashion forward? ✔ Check your overall knowledge of how to conduct an effective job search, and specifically of how to network and interview. Find out what you don’t know, and read, take a course, or get a coach to learn the fundamentals of how to find a job in 2014. ✔ Check your currency when it comes to knowledge of your field. Identify gaps in your current knowledge, training, certifications, and experience that could prevent you from making a favorable impression in front of an interviewer or contact. Figure out how to fill the gap and get started filling it! The take-away is this: Whether you like it or not, whether it’s fair or not, first impressions count. They can rule you in or out of the competition very early in the job search and interviewing game. Take care to identify the type of impression you want to make and make it!